What was your inspiration for Wintergirls? I was reluctant to take on the topic of eating disorders because it hit too close to home. I never could be classified as anorexic, but disordered eating was definitely a piece of my life. I’ve battled a poor body image my whole life; they called me “Baby Hippo” when I was a kid and “Moose” when I was in high school. I remember the voice that whispered, “You’re fat. You’re ugly. You’re stupid.” It started when I was 11 years old and haunted me for decades, tearing down my confidence and driving me to eat in an unhealthy way. The last thing I wanted to write about was an eating disorder. But my readers convinced me to write Wintergirls. I received emails and letters from kids struggling with eating disorders and they touched me deeply. At the same time, a lot of girls—and some boys—started to talk to me about cutting. They didn’t know how else to deal with the pain that was overwhelming them. The third factor was a friend who is a doctor.She had been bugging me for years (in a very not subtle way) to write about eating disorders, because she saw so much of it in her practice. She felt that there really hadn’t been a good novel written about eating disorders, and she thought I might be able to write one. I realized that all these threads were showing me a clear path, and it was time for me to take my own challenge and dive into something that was difficult to see what I could make of it. My pediatrician friend helped me with the clinical details and referred me to some psychiatrists. I spoke with them and did as much reading as I could in medical journals. I went to pro-ana web sites (which foolishly promote anorexia as a lifestyle choice) to see what they were talking about. I also spoke with ED survivors who were well into their recoveries. It was a process of gathering crumbs of information and stowing them all away and waiting for the voice to come. And then Lia showed up in my head and started talking. Why did you decide to weave classical mythology into the story? A few years ago I heard David Almond talk about the need that children have for myth. He said kids with really hard life issues can often see things more clearly in a myth than they can in realistic fiction. His words sparked my desire to use magical realism and myth in Wintergirls. I struggled for a bit trying to understand the larger story of eating disorders. Then I realized that it was Persephone’s story. Persephone goes into hell and the world plunges into winter because her mother, Demeter, is scouring the earth, trying to figure out how to help her daughter. Everything fit into place for me at that point. I’m sure there’s a name for it, but the technique you used in the text of crossing out certain pieces of dialogue — how did you come up with that idea? What should we talk it? Let’s call it the strikethrough technique. I saw it used on a blog three or four years ago. And as soon as I saw it, I realized its potential for use by an unreliable narrator. The strikethroughs show how the narrator does not allow herself to acknowledge what she’s feeling. It allows the reader to see more than Lia can see about herself. Because graphic novels have really become popular in the last decade, I felt the time was right to play with graphical elements. That’s why I used the strikethroughs, right-centered text, smaller font text, and white space. There are two completely blank pages in the book, which my editor was gracious enough to allow me to do. That was fun. Were you worried that the book would make teens develop an eating disorder? I take my responsibilities to my readers seriously. When I was working on the book, I spoke to a number of mental health professionals. The experts said some readers might use the book to help them in their quest to lose weight. But they all said that should not stop me. Starvation tips are one click away on the internet. They said that writing a book that told the ugly truth of death and near-death from eating disorders would, in the long run, educate people and bring much-needed discussion to the topic. I take hope from the steady flow of email and letters I’ve been receiving from people who read Wintergirls and decided to get help; readers with eating disorders who appreciated seeing their truth on the page. Lia’s story gave them the courage to talk to their parents and to be honest with their doctors. Wintergirls does not glamorize eating disorders. It is real and for that reason, it has become a positive tool, something helps people reach for help and health. What do you think is missing in our culture’s understanding of eating disorders and its reaction to the people who suffer from them? We are idiots about eating disorders. First, there needs to be much more research so the docs can understand better the physiological and psychological underpinnings of these disorders. And insurance companies must start paying for rational amounts of inpatient care, Cutting off benefits to someone with an ED after three or four weeks of treatment makes no sense at all. I also believe there are aspects of American life that fosters the development of eating disorders. Capitalism has many fine qualities to it (I’m rather fond of capitalism) but if you don’t have a firm spiritual foundation under you, you can become dangerously vulnerable in our media-driven age. A while back advertisers retouched the photographs of a fashion model who was 5’10” tall and weighed 117 pounds to make her look even thinner than she was in real life. It makes me want to scream. At a time when our nation’s obesity rate is higher than ever, teens are subjected to constant advertising of models who are made artificially thin. Magazines are sold, reality shows launched, and a billion-dollar-a-year dieting industry are all based on making you feel bad about the way you look. When you buy into the message that your self-worth should be measured on a scale, then you give up your power. You hand it over to people who will prey on your insecurities. Advertisers work very hard to make you feel bad so you will buy whatever it is they are selling. Speak has led to many more open and constructive discussions about sexual assault. I would like to think that Wintergirls will lead to discussions of why we give our power about body images over to the people who are hired to make us hate ourselves. What are some of the aspects of eating disorders that you think are not understood or discussed enough? Aside from the manipulation I mentioned above? Ten percent of Americans with eating disorders are male, but the public face of eating disorders continues to be female.The boys and men I’ve spoken to who struggle with EDs feel invisible. Also, few people know that anorexia has the highest mortality rate of any mental illness. If that became more commonly known I think eating disorders would be treated more seriously. Do anorexia and cutting often go hand in hand? I’m not a doctor, so I can’t answer that definitively. But I know I’ve seen a rise in cutting in the past decade. Happy peoples don’t cut themselves. I wish adults would spend less energy freaking out about the cutting itself and work harder to understand what drives kids to self-harm. Wintergirls discusses some dark issues. A lot of your books do. Is there something about that darkness that intrigues you? When I was a teen, nobody would talk to me about the dark things in my life. I couldn’t even find books that dealt with the gritty things. I hope that my books can make a positive difference in the life of reader who is struggling like I did. 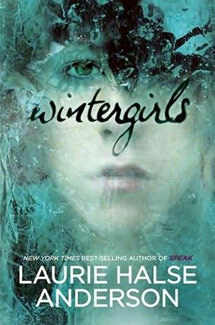 Some people say that Wintergirls is a hard book. It should be. Eating disorders are deadly. This is why I don’t pull any punches in Wintergirls. The book is raw and disturbing and scary as hell, because it tells Truth. We are allowing our culture to destroy our children with dangerous concepts of body image. Too many of my readers have a little bit of Lia or Cassie festering in them; that sense that they will only be valued according to the number that shows up on the scale.Wintergirls gives them a chance to name the demons that haunt them and take back control of their bodies and souls. Did the novel change how you understood your own issues with disordered eating and body image? Absolutely. It helped me get rid of the snakes in my head and love my body. Especially my thighs. It also gave me compassion for both ED sufferers and their families. I can’t think of anything harder than to have a child struggling with an eating disorder. We toss the words “anorexic” and “bulimic” around very casually in America. There is nothing casual or light-hearted about them. They are mental illnesses that are devastating, and they take a toll on the entire family. What do you say to readers who are struggling with eating disorders? I strongly, strongly suggest they speak to a doctor for professional advice.Eating disorders have the potential for disaster and need to be treated by people who know what they’re doing. NEDA is a good place to start your search for help.